Cerridwen, a Celtic Crone Goddess, presides over the Cauldron of Knowledge. 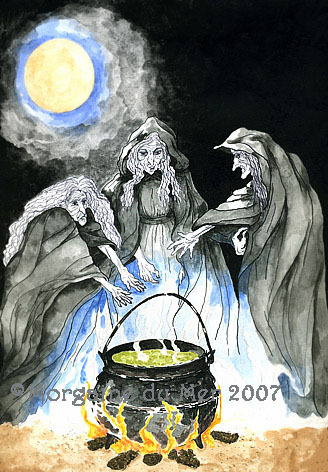 Throwing mysterious ingredients into their cauldron these three witches (the Weird Sisters) stirred up quite a lot of mayhem in Shakespeare's Scottish play. 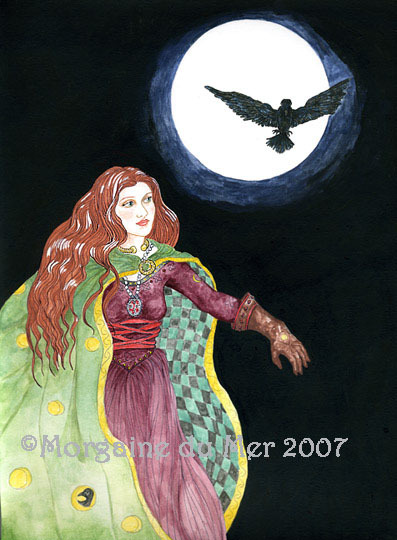 A woman learns the art of shapeshifting from a wise raven. 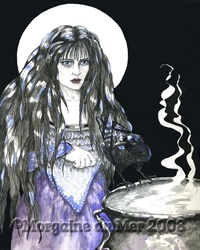 As she chants the magickal words over the cauldron, a transformation slowly occurs...Her hair turns blue/black and her dress becomes feathers as she takes on the raven form. Soon she will be soaring in the air, learning to fly with the ravens. With various potions to choose from a Witch conjures a spell to coincide with the full moon. A little of this and a pinch of that go into the ancient black cauldron. 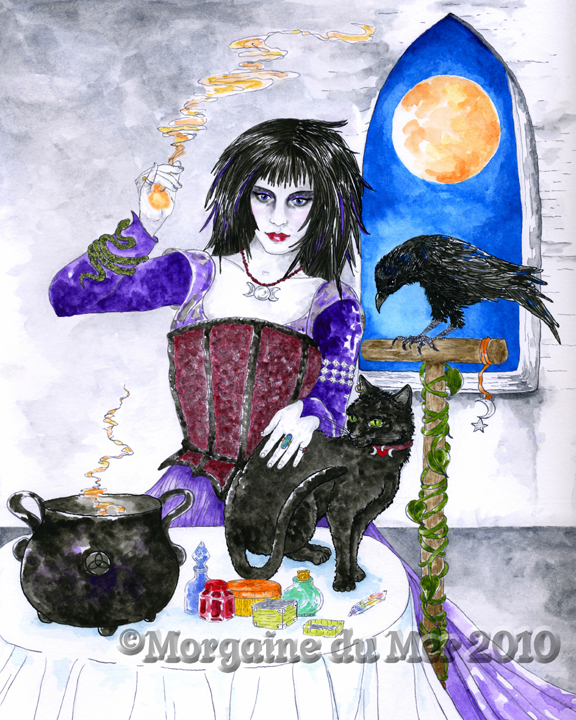 Her trusty animal companions, cat, raven and snake, look on as the magick begins to happen. 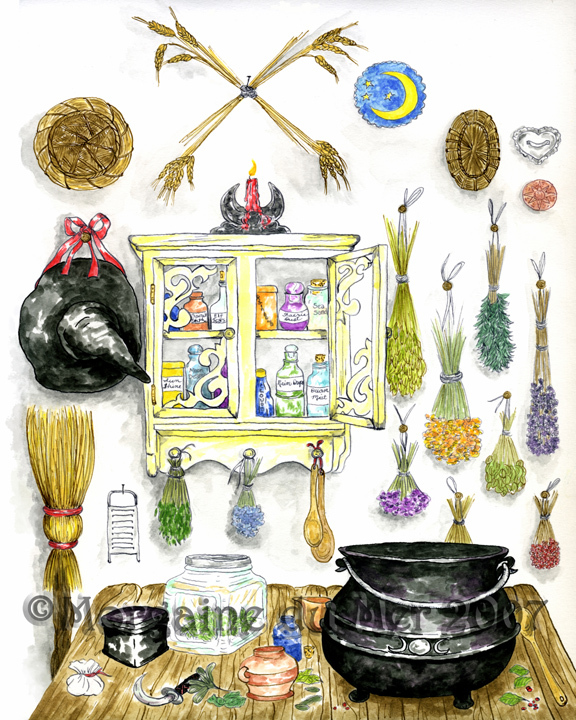 Herbs, cauldron, mysterious potions...all the tools of the trade. The Wise Woman collects plants and knows their healing attributes. And maybe she brews up a love potion or two. 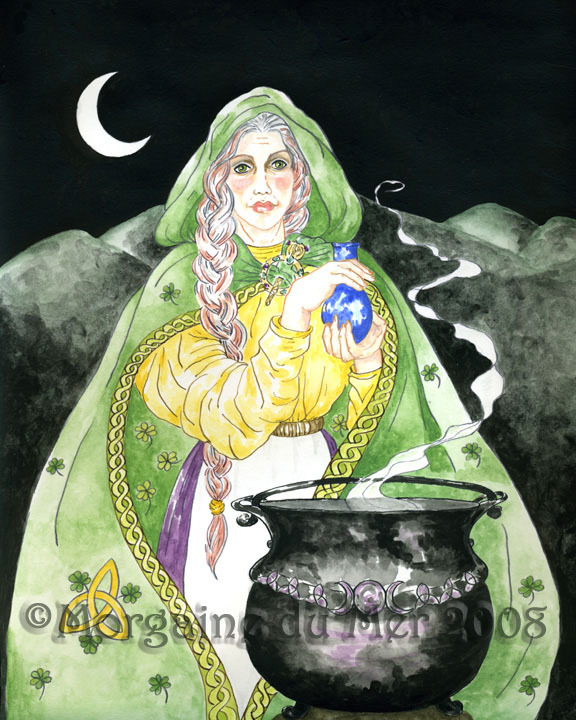 Known also as Biddy Early, the White Witch of Clare lived in Ireland in the 19th century. 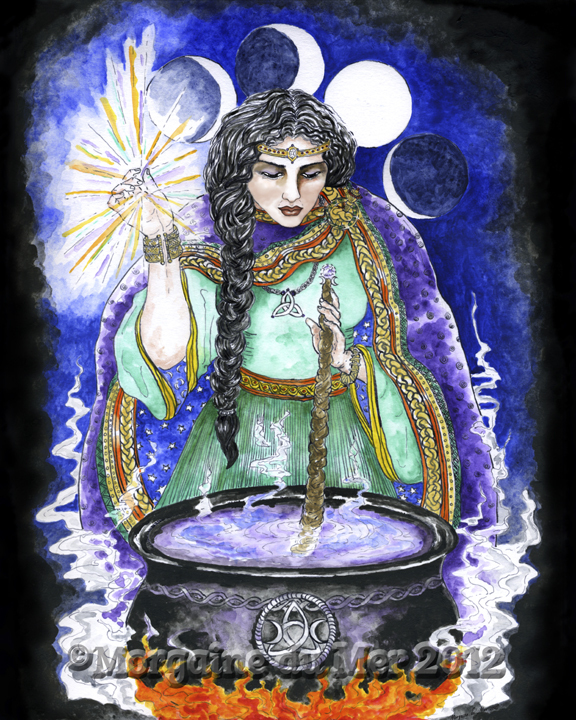 She is shown here with her magick blue bottle.
" 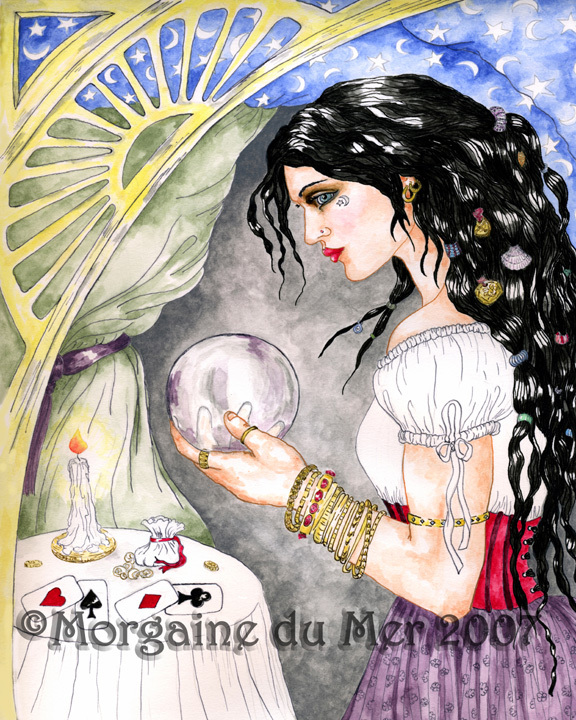 I gaze into my crystal ball. 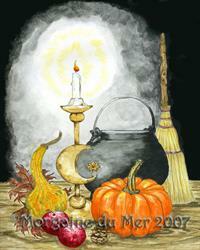 Past, present and future, I see it all." The Fortune Teller divines the future and sees into the past. She can also read the tarot cards and see events to come. Wicked...or Misunderstood? 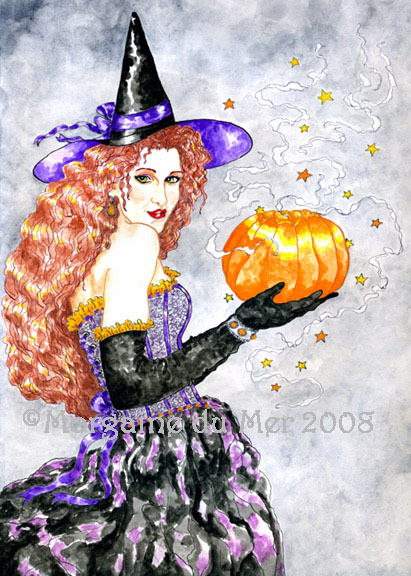 Does her beauty hide a sinister heart? Does she offer a cup of golden mead or a draught of hemlock? 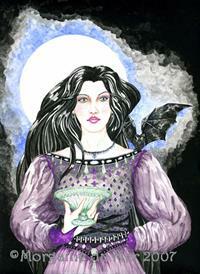 Is it a dagger she has behind her back or a bouquet of flowers? 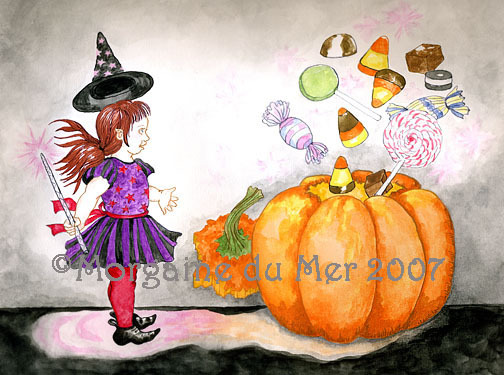 Appearances can be deceiving, you decide! 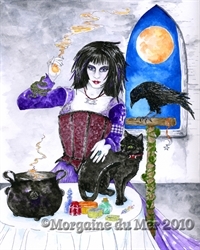 Summoning her Raven, the Witch of Ravenshire prepares for a night of full moon magick. 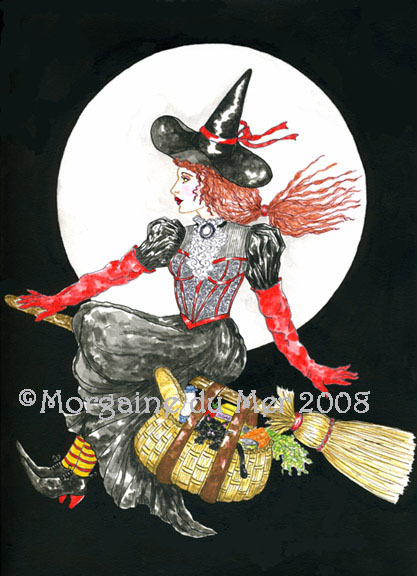 A bright orange harvest moon night is perfect for a witch to try out a brand new broom. 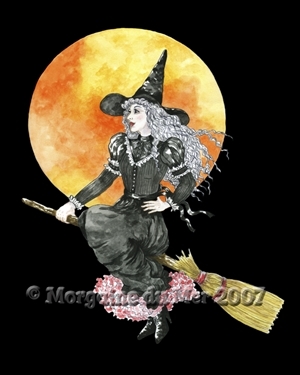 Her ruffled red petticoat peeks out from under her lace embellished dress. A fashionable witch in a gorgeous purple and black lace-trimmed gown holds a magick pumpkin. Wear your best for a magickal Halloween. A curious shoppe at the end of the lane with some unique witch hats for sale. 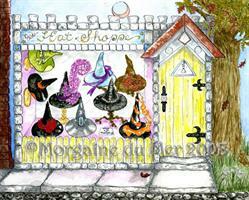 A most unusual shopping experience awaits behind the yellow door. 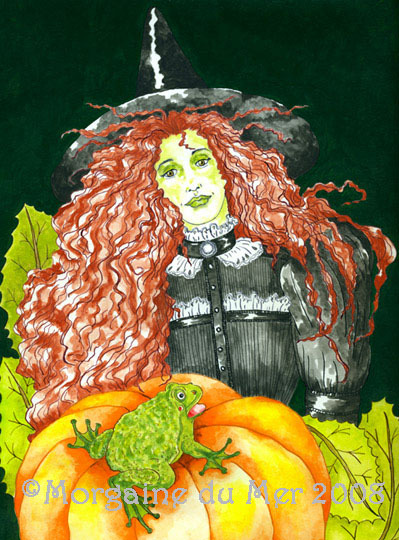 A shy green witch finds a kindred spirit in a friendly green frog. 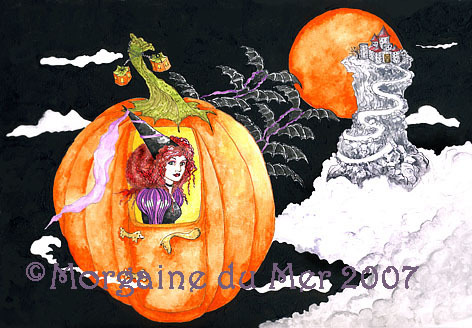 A beautiful witch princess rides in pumpkin coach drawn by bats to the Halloween Ball held at an enchanted castle in the clouds. 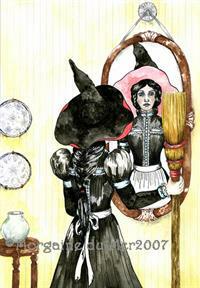 A housewife tries on her new hat and decides that flying on her broom would be more fun than sweeping with it. 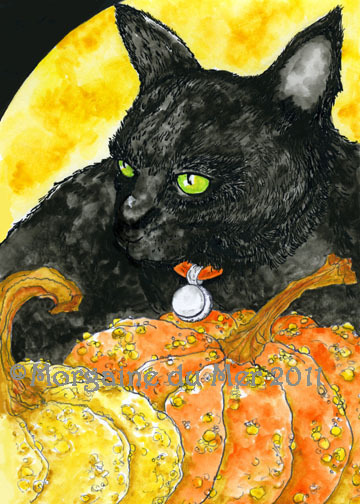 This pretty kitty with mesmerizing green eyes sits beside some warty gourds in anticipation of Halloween. 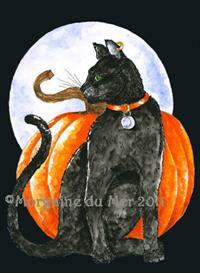 A handsome black cat waits for Halloween under a blue moon. 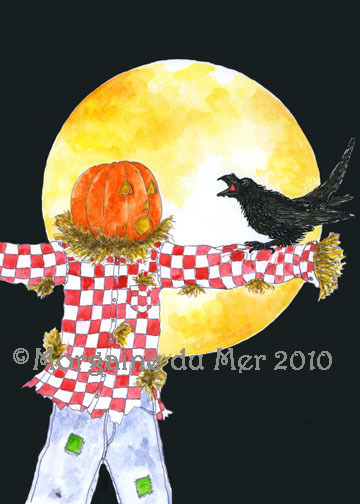 Who is scaring whom? A scarecrow and a crow surprise each other under a bright harvest moon. 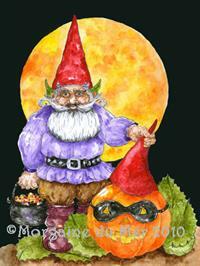 Gnomes love Halloween! 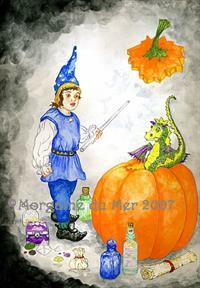 A gentleman gnome provides a disguise for a jack-o-lantern and carries a cauldron of candy corn. 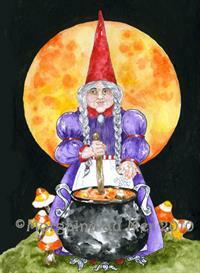 His wife, a gnome witch, creates candy corn in her magick cauldron by the light of a harvest moon. No tricks here! 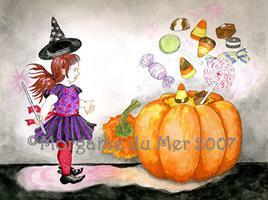 A little witch conjures up a pumpkin full of sweet Halloween treats. 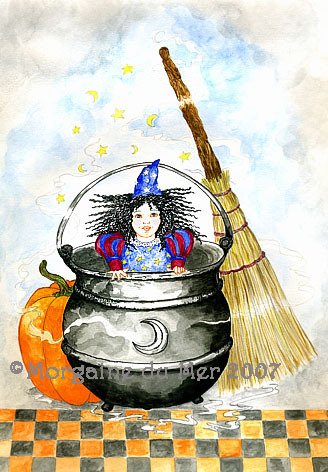 A curious little witch casts her first spell with some hair-raising results. Her cauldron, broomstick and pumpkin levitate in mid-air! 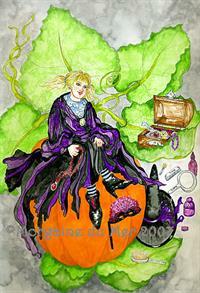 While the Wizard is away, his assistant did play...And created an interesting surprise! A baby dragon pops out of a pumpkin. A little witch borrows her mother's clothes to be the best dressed at the Halloween party. Flying Witch on a shopping spree! This broom has a handy side car to carry purchases and a cat. Don your red driving gloves and try out the latest in wind and moonbeam powered hybrids.